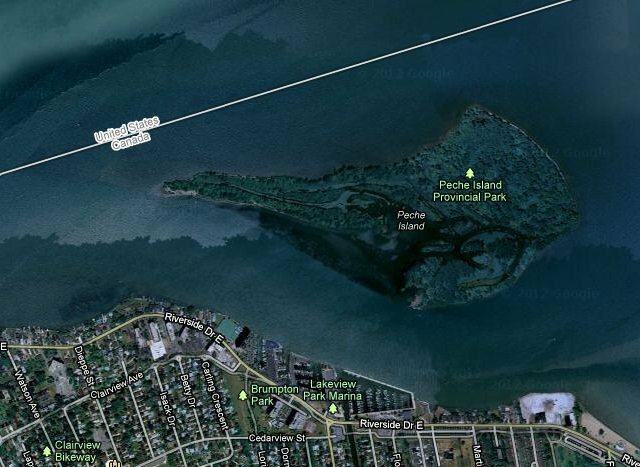 Celebrate Peche Island Day on Saturday, September 23rd. Running from 10am to 3pm, the event offers free transportation from Lakeview Park Marina to Peche Island by boat or Montreal canoe. While on the island, guests are invited to enjoy self-guided tours, visit the historical Hiram Walker summer-house ruins, and see the 175 year old native trees and lush wetlands. Event participants can also help install a new Bald Eagle platform. Bald Eagles nested on the island for 4 years until the tree became unsuitable several years ago. By providing an adequate platform and nesting material, the City of Windsor and DRCC hope to bring eagles back to the island. Starting in the 1950s, Bald Eagle numbers in the Great Lakes began to decline because of widespread use of pesticides, like DDT, and other factors. In the last 20 years, researchers have seen a tremendous recovery in Bald Eagle population and other wildlife, such as Lake Sturgeon, beaver, and Lake Whitefish in the river, which indicates an overall improvement in water quality and ecosystem health. This free event is open to all members of the public. The last boat will depart the mainland at 1pm, but organizers are expecting increased interest in the event and potentially long lines. Boats will depart and return to Lakeview Park Marina. Due to limited onsite parking, guests are encouraged to bike to the marina, carpool and/or use public transit.